Kandinsky was a trailblazer of modern art, a practitioner of ever-more-radical abstraction and the author of key theoretical works concerned with the spiritual and formal content of art. In Open Green, painted in 1923, his interests in spirituality and form seem to converge in a dreamscape of color and shape at once abstract and gnomically figurative. Born in Russia, Kandinsky was a devoted student of Russian folklore and icon painting, and the conglomeration of swooping shapes—a circle pierced by a long, slender diagonal; two curving, whiskered commas; a receding checkerboard of translucent color—in the upper right-hand quadrant of this composition has sometimes been read as a depiction of the equestrian Saint George, patron of the Russian Orthodox church, holding his lance and shield and galloping into the heavens. Vasily Kandinsky created a visual abstract language that signifies the spiritual nature of the visual world. He called it the “music of the spheres.” In this painting, Open Green, the animated field of colored lines and planes alternate and intersect, acting and interacting like a visual symphony. Here one such angle appears within a large circle—the form Kandinsky saw as the symbol of the cosmic fourth dimension. Like Paul Klee, Kandinsky taught at the innovative German art school called the Bauhaus. He stayed until it was closed by the Nazis in 1933, and subsequently moved to Paris, where he remained until his death in 1944. 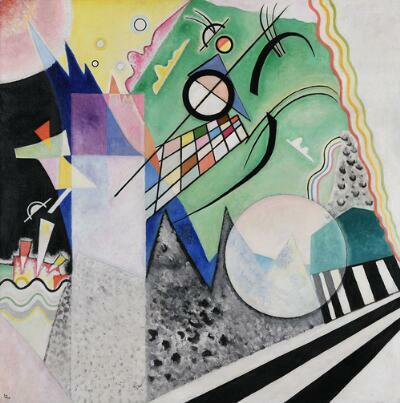 Kandinsky’s pictures and his extensive writings have had much influence on 20th-century art. This work is part of The Blue Four Galka Scheyer Collection at the Norton Simon Museum. To hear Tom Brokaw tell the story behind this extensive and important collection, press 3211.